Nepute Wellness Center is unlike any medical clinic you may have been to. The clinic team is focused on finding and fixing the CAUSE of your problem vs. seeking out and treating only the SYMPTOMS. Nepute Wellness Center is equipped with state-of-the-art diagnostic equipment and testing, as well as medical doctors, nurses, and chiropractors who have been uniquely trained to treat your whole body, regardless of age, and return your body to a healthy balance so that it can heal itself the way God intended. If you are tired of trying to treat your symptoms using prescription and over-the-counter pills, or even considering surgery, then Nepute Wellness Center may be right for you! Or like many, you want to be proactive with your health and prevent sickness and disease before you begin to suffer any symptoms, allowing you to live the full life you deserve, then make Nepute Wellness Center your partner in health! As Dr. Eric Nepute was growing up in the small town of Carlinville, Illinois, little did he know how the town’s passion for football would shape his future. Dr. Eric was a natural athlete and football was king. He excelled at it, playing as an all-star for his high school team and eventually earning a football scholarship to Millikin University. Football wasn’t his dream though; from childhood, Dr. Eric had dreamed of being a top surgeon. Until a shoulder injury led to a revelation. When you don’t know your options, you take your injury to a traditional doctor, and that’s what Dr. Eric did with his injured shoulder. After the examinations were done, Dr. Eric was told, “We’re sorry, but you can never play football again, and you’ll probably never have full motion of the shoulder.” So he retired his football career, finished his bachelor’s degree, and might have simply lived the rest of his life with a handicap if he hadn’t met a chiropractor who looked at his shoulder and told him, “We can fix this.” That was music to Dr. Eric’s ears, and once the chiropractor was able to put the shoulder into a state where it could heal itself, it became obvious that seeking answers only from traditional medicine had already limited Dr. Eric’s possibilities. He had missed his chance at a football career (even if it had been limited to college stardom) but at least he would still be able to throw a football to his son. How many people get that second chance to live the lives they’d planned? How many are living with debilitating pain simply because traditional medicine doesn’t have a cure? After Dr. Eric’s path was changed by that shoulder injury, he knew he wanted to make a real difference in people’s lives. 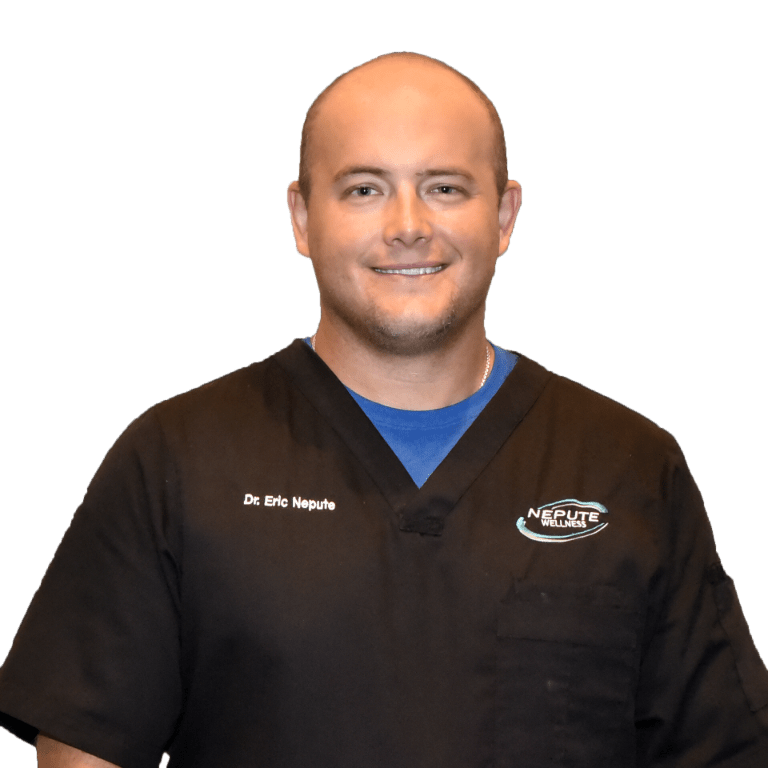 He committed himself to a career in Chiropractic Wellness Care and would go on to graduate from Logan College of Chiropractic with advanced studies in sports medicine, advanced nutrition, applied kinesiology, functional neurology, internal health, and anti-aging. As Dr Eric says, “People judge their health on how they feel instead of how they function, and it’s the biggest mistake a person can make.” It is now Dr. Eric’s mission to empower all people to no longer be a victim of their health or circumstances and instead learn how their body works and how to achieve a state of total wellness. Dr. Eric has become a sought after speaker in the health and wellness community, speaking on topics ranging from stress management to how to live a pain free life. He has helped businesses both large and small save hundreds of thousands of dollars by assisting in their health and wellness programs. His unique ability to simplify complex health issues has brought Dr. Eric to the top of his field, not only as a clinician but also as an expert speaker. Dr. Eric’s workshop programs have been called “educational, motivational, and inspirational” by Dr. Bob Hoffman, author of The New York Times best seller, Discover Wellness. Our Medical Director is a medical Doctor licensed in the state of Missouri who is able to carry out and oversee any medical procedures such as natural pain management, injectable nutrition, bioidentical hormone therapy, physical medicine, or any other medically necessary services. Our medical team has the same belief that our body can heal itself from all things. However, we know that sometimes we need to intervene with natural solutions and sometimes synthetic services to help improve the body’s ability to heal. Our doctors do not push medications or surgeries on patients unless it’s a last resort. An extension of the medical team that works in collaboration with the medical doctor. The nurse practitioner caries out most of the day to day procedures directed by the medical director as well as exams and re-exams. All of our nurse practitioners have been trained in iv nutrition, stem cell therapy, rejuvenated medicine techniques, natural pain management, physiotherapy, as well as neuromusculoskeletal and chiropractic care. We have several pediatric nurse practitioners as well as pediatricians who we work directly within our office who have a natural approach to raising healthy children naturally. We are very excited to have this service added to our practice. All of our family nurse practitioners and pediatricians are licensed in the state of Missouri and are here to assist your every need. Our medical assistants are certified medical phlebotomists who will assist in the day to day workings of the office as well as assist in procedures and in exams and re-exams as necessary. We have a team full of front desk team members; receptionists, insurance billing and coding, documentation specialists, compliance officers and customer service relations. We have people of all backgrounds to help your experience here the best experience possible. The most important thing to know is that we care about you and your family. We know it’s important to you to get the care that you deserve and your family deserves. So if you have any questions at any time please ask any of our team members, they will be happy to assist you with any questions or concerns.